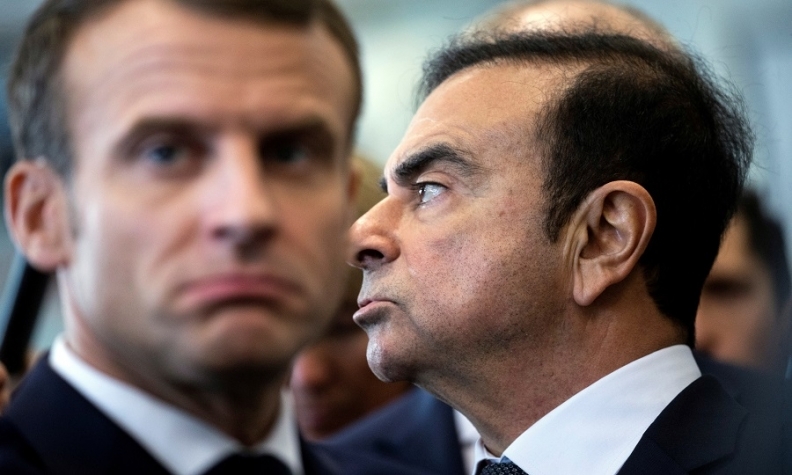 Macron, left, and Ghosn have locked horns in the past over Ghosn's pay at Renault. PARIS -- As Renault's largest shareholder, the French government might be expected to stand up for Carlos Ghosn as he fights charges in Japan that he underreported tens of millions of dollars in compensation from the automaker's alliance partner Nissan. However, the accusations against Ghosn come at a critical time for the French president, Emmanuel Macron, who is facing the biggest crisis of his young presidency -- the mass "Yellow Vest" demonstrations that were sparked by a proposed increase in diesel taxes. The protests have since turned into a popular referendum on Macron's reform plans for the French economy. Protesters have smashed up storefronts in central Paris and are portraying Macron as a" president of the rich." Macron's popularity has plummeted. In an attempt to quell the protests, Macron announced a package of emergency concessions on Monday -- the same day Ghosn was officially charged in Japan -- aims at helping retirees and the low-income working people. Renault's board meets on Thursday amid mounting pressure to dismiss Ghosn as chairman and CEO. It is also expected to learn of preliminary findings of an internal Renault audit of Ghosn’s compensation. The French government has a 15 percent stake in Renault and two seats on the board. It would be politically risky for Macron to be seen defending Ghosn, who earned more than 15 million euros a year as the longtime head of both Renault and Nissan, and flew around the world on a private jet. Ghosn, who is in detention in Japan, was ousted from his post as Nissan chairman but remains Renault CEO and chairman. Chief operating officer Thierry Bollore has been given Ghosn's CEO powers temporarily. French unions, who are among the strongest backers of the yellow vest protests -- and have seats on the board -- have called for a fresh start at Renault. Macron is conscious of the importance of the Renault Nissan Mitsubishi to France. He spoke to Japanese Prime Minister Shinzo Abe at the sidelines of the recent G20 conference in Buenos Aires about the need to maintain the alliance and the stability of Renault Group. Abe, for his part, said the future of the alliance should be hashed out among the companies, not by governments. But Macron has said nothing publicly about Ghosn. Most of the French government's views on the affair have been voiced by Bruno Le Maire, the economic minister, who has emphasized Ghosn's presumption of innocence and asked for proof of his misdeeds. "We're not going to propose that Mr. Ghosn step down for the simple reason that we don't have any evidence," Le Maire said on Nov. 21, two days after the executive's surprise arrest. Nissan finally communicated its 400-page dossier on Ghosn's alleged misconduct to its 43.4 percent-owner Renault via lawyers on Monday, French government officials said. However, the government said on Tuesday it remained unaware of detailed allegations against Ghosn. Pressure for Ghosn’s formal dismissal from Renault appeared to be growing in the wake of the Japanese indictments. Officials from two centrist Renault unions, the CFDT and CFE-CGC, are privately urging management to replace Ghosn permanently, sources said -- joining the leftist CGT, which was quick to call for leadership change after his arrest. "Whether or not he's found guilty, his image among staff is so tarnished that I can't imagine him returning to his post," said an official with one of the moderate labor groupings. "It's not easy to oust him without appearing to prejudge the case -- but that's really a communication problem now." Macron and Ghosn have locked horns in the past over Ghosn's pay at Renault. Macron thought it excessive and the government forced Ghosn to accept a pay decrease this year. Ghosn also sought to reduce the French government's influence in Renault because Nissan didn't like French politicians having a say in how the Japanese company was run. Macron raised the government’s stake in Renault to 20 percent in 2015 as finance minister without informing Ghosn ahead of time. The stake was later reduced back to 15 percent and their relationship had reportedly improved since Macron became president in 2017.